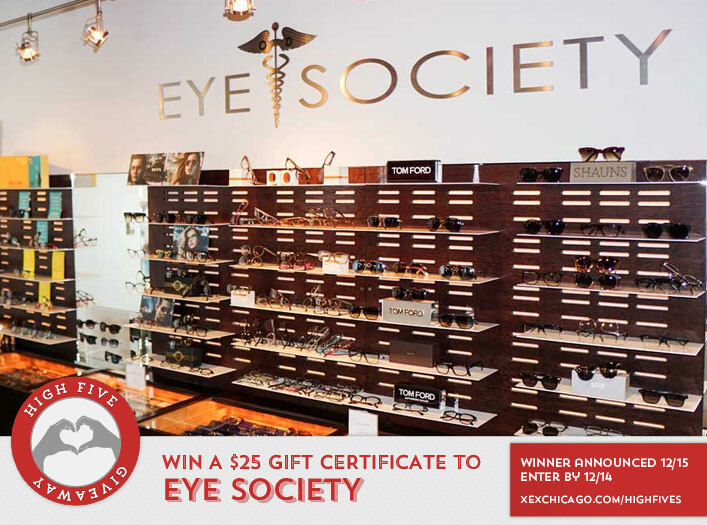 Win a $25 Gift Certificate to Eye Society! Congratulations to Christine Crowley on winning our 171st High Five Giveaway and thank you to all who entered! Our next giveaway is for a $25 gift certificate to Eye Society. Ensuring your optical health and vision needs are Eye Society’s foremost priority. Using state-of-the-art computerized testing, pre-testing by medical assistants and thorough examinations by our doctors, Eye Society assesses the patients’ visual system and determines what type of visual correction provides the best solution for each individual. Visual correction may include glasses, contacts, laser vision correction, or corneal refractive therapy. For the solutions not offered by Eye Society, informed recommendations can be provided. While many eye exams end with visual correction, Eye Society believes that the eye health evaluation is the most important part of an eye exam. Our evaluation continues with Glaucoma testing, dilated fundus examination, and diagnostic retinal imaging is performed to evaluate the health of the eye. Eye Society is located at 230 E Ohio Street and 1 West Wacker Drive, Chicago. Their phone number is 312-640-2405. Visit their website at www.eyesoc.com. What is the name of Aveda’s sulfate-free hand and body wash? Now, just add a comment to this post with the right answer to be eligible to win! The winner will be announced on Thursday, December 15. Entries must be received by midnight on Wednesday, December 14.